The new standards present a vision of science and engineering learning designed to bring these subjects alive for all students, emphasizing the satisfaction of pursuing compelling questions and the joy of discovery and invention. Achieving this vision in all science classrooms will be a major undertaking and will require changes to many aspects of science education. 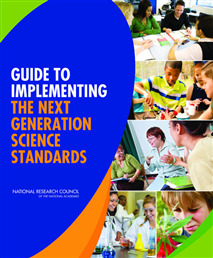 Guide to Implementing the Next Generation Science Standards will be a valuable resource for states, districts, and schools charged with planning and implementing changes, to help them achieve the goal of teaching science for the 21st century.